This video is from Billy Joel’s DVD The Essential Video Collection (Columbia Music Video). The track is about George Young, a teenager living in the New York area who contemplates committing suicide after he wrecks his car and breaks up with his girl friend. 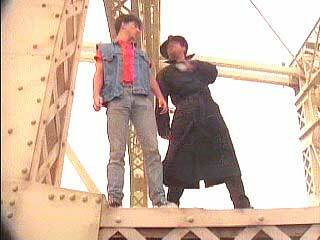 Joel plays a harmonica-playing friendly spirit who meets up with the teenager as he is about to jump off the bridge. 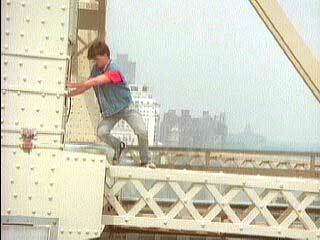 George starts to climb the bridge he plans to jump off. 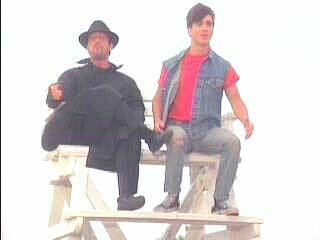 The camera pans in on a closeup of George’s black high tops. 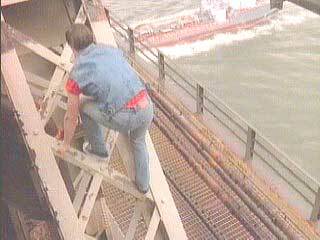 George starts to climb to the edge of the bridge’s metalwork. Billy Joel takes George on a visual tour of what his life is and could be, showing the teen what the consequences of his suicide will mean to his family and friends, and to the lives of others. Don’t be suicidal! Put on a pair of black high top chucks (click on the thumbnail to order) and have a great life.